Some hold that Bhagavata is a Maha Purana and Devi Bhagavata is an Up-purana. While others think vise versa. Similar is the case with the Vayu Purana and the Siva Purana. We are not indulging ourselves in this discussion and only say that though the number is said to be eighteen but there are twenty books (Puranas) which come under the title of Mahapuranas. This question has been a bone of contention between the Vaisnavas and the Saktas during the last few centuries. So many references are cited in support of both the works by the scholars. Siva Purana cites a verse in support of Devi Bhagavatam. 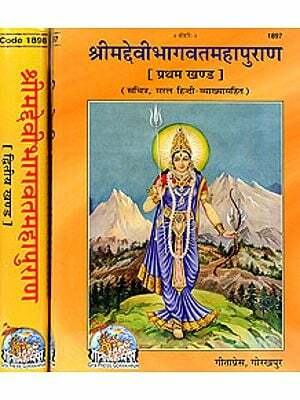 Bhavisya Purana is also of the opinion that Devi Bhagavata is to be included in the great 18 Puranas and not the Bhagavata. The Devi Bhagavata, though praises Devi as the highest deity, the study of this Purana reveals that at the time of its composition the most prominent deities were, Visnu, Siva, Ganesa and Devi. The devotees were also called as Vaisnavas, Saivas, Ganapatyas and Saktas respectively. Though almost all these sectaries imbibed Sakta ideas, more or less, some of them followed the Vedic path but the majority was guided by the Tantras and Agamas. Thus the author of the Devi Bhagavata advocates the unity of all the gods, saying that all these gods are one and the same in reality. This Purana, as its name indicates, deals with the praise of Devi as the highest deity and the energy of all gods and others. Thus a brief description of its contents shows that Devi Bhagavata Purana may definitely be called as Sakta Purana. It conceives of a central Goddess called Devi Sri Bhuvanesvari. She has been described a beautiful, four-handed, resident of manidvipa and is a Saumya Goddess. Like Vedanta this Purana describes her as Nirguna and identifies her with Parabrahma. She is Mula Prakrti and divides herself into Purusa and Prakrti. She is Mahamaya and creates Visnu, Siva and Brahma out of herself and enables them to perform their respective duties. She is the mother of whole universe and the Sakti of all. This Purana lays special stress on Bhakti as a means of realizing Devi and considers Jnana to be the same as Bhakti, in its highest state. Although a Sakta work, the Devi Bhagavata holds the Vedas in high esteem and tries its best to establish their authority among the people. It regards 'Sruti, Smrti and Puranas' as sources of Dharma and looks upon the first as the highest authority. Similarly the Tantra have also been praised. Tantric Bijas and Mantras of different deities have been prescribed. It is said that every Dvija doing Gayatri japa is called Sakta according to this Purana. In Devi Bhagavata purana we find the benign aspect of the goddess is praised always helping the devotees and the poor, helpless fellows and punishing the wicked ones. Her form is described as world renowned benign form granting grace and benefit to all and even giving Mukti to all the people. Thus this Purana is rightly called the epitome of Saktism and respected very much by the Saktas. This Purana gives respect to each and every deity, the supreme position but he gives Devi, the life and energy of all. It is very important for synthesizing the various sects and philosophies of India. May the goddess Sri-bhuvanesvari bless us for the upliftment of mankind especially the poor ones.